It's not all 'Club 18-30 on ice' down here! No really! For most the last week I've been baffled by sensors on the CASLab mast cutting out for no reason. It's over a kilometre away, so a good walk or ski. But as soon as I get back, the problem seems to return! After numerous trips, I've isolated the fault to a power supply and have made a temporary replacement while I build a permanent fix. More trips next week then, but the weather should improve which means excellent skiing! We've also been ticking off the annual checks on other instruments. 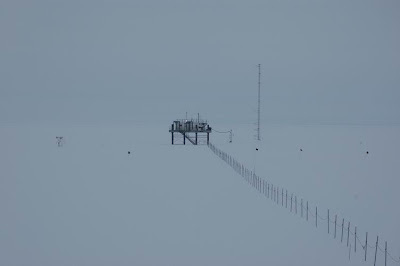 This afternoon Tams and I climbed the met mast to calibrate up the Present Weather Detector, a cunning device to measure snowfall rate. Mast work is interesting and good fun. 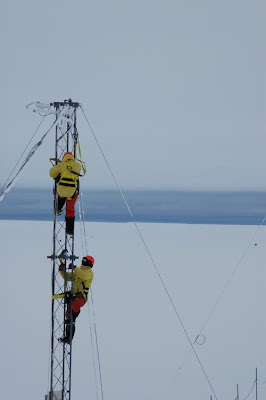 There's a lot of co-ordination and even more planning involved in doing fiddly jobs when dangling from a harness in -15C. Aye up lad, glad to see you're earning your bed down there. You mentioned sorting the PSU. Is it your job to heath robinson one up or do they have complete plug and play replacement boards for everything down there? Just wondering if you're still doing some good old engineering or if the disposable attitude has permeated to the ends of the earth yet. Me and Lucie had booked the sun for this biking weekend and the rare puddles we went through were nice to cool us down! We had minamal bike faff and the only hic up was an over ordering on the eggs - but Ginger Paul found a good use for them much to the benift of Martins hair!! Looking forward to you taking over again next year . . . .
Dave - A lot of the kit is plug-and-pray, but once we run out of black-box swaps, it's time to get the datasheets and soldering iron out. Propper engineering!